I’m giving video content a try with my series Play this! In it, I highlight overlooked games and the reasons why I think you should play them! Today I wanna talk about Virginia, a game that shows how “editing” can improve storytelling in games. If you rather read than watch a video, then please find the clip in article form below. First: It manages to tell a surprisingly complex story without any kind of dialogue or narration. Usually, story-heavy games rely on written and spoken words like cutscenes or logs and diaries. You’ll find none of that in Virginia - instead, the game has another trick up its sleeve, which leads me to reason number two. Virginia uses “cinematic editing”, harsh cuts that change the scenes from one moment to the next. This sounds like a minor thing - after all, we’re used to cuts from movies and TV shows, right? No, this is actually huge. I feel the need to stress what a big change this is when actually playing a game. Contrary to movies and TV shows, where you simply watch, games put the player in control - and usually it’s a big no-no to take control away from the player, letting them make all the decisions and movements - even if that means they would have to walk the same part of a level over and over again. 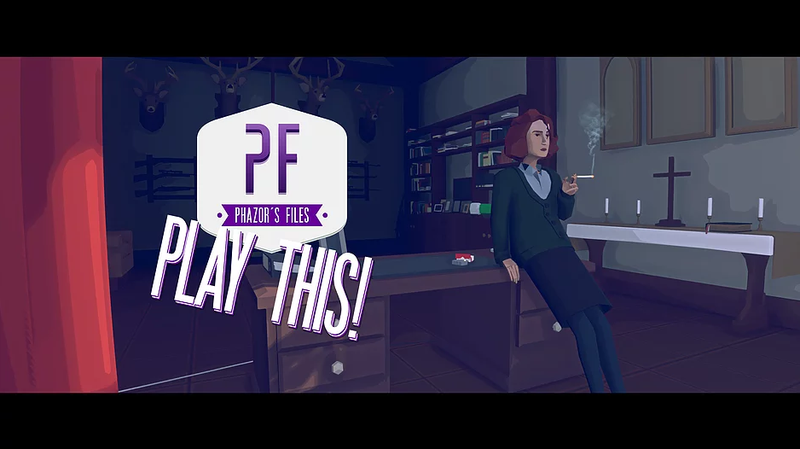 Now Virginia jumpcuts the player through different scenes in an instant - and thus cut out all the unnecessary gameplay-fat we find in other games. In addition, it uses these cuts to create a context to scenes, introduces symbols and metaphors that help the player figuring out the story themselves - instead of simply spoon feeding it. This is what makes Virginia really stand out. The third point is it’s distinct and great art direction - the stylised look help with the clarity of the story and the soundtrack could be cut right out of Twin Peaks. The games short length (it’s about 2-3 hours long) also helps: It might sound very brief, but not a single moment of Virginia is filler - something a lot of other games could learn from. I think you should play Virginia if you like a short and creative game with an emphasize on smart storytelling. It is available on PC, Mac, PS4 and Xbox One.